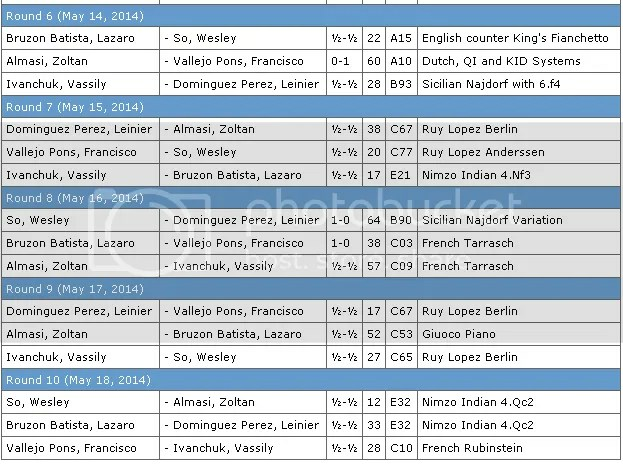 The Philippines’ #1 Chess Grandmaster Wesley So, formalized his fantastic conquest of the Capablanca Memorial Chess Tournament 2014, the 49th Edition, when he finally had drawn, in only 12 moves of a Nimzo-Indian, his last round (R10) game against defending Champion GM Almasi, Zoltan(2693) of Hungary to register 6.5/10 points, a clear 1.0 point advantage to 2nd placer GM Bruzon Batista, Lazaro(2682) of the host country Cuba who scored 5.5/10. So dominant was Wesley at Capablanca 2014 that at halfway mark (after 5-rounds) he registered 3.5/5 (+2-0=3) points and snatched the sole lead by beating defending champion GM Almasi, Zoltan (HUN)2693 in a 48 mover French Defense: Winawer. Poisoned Pawn Variation Main Line (C18). The top seed Domínguez Perez, Leinier (CUB)2768 made a quick 13-mover draw [Ruy Lopez, Closed (C92)] with his compatriot Bruzon Batista, Lazaro(CUB)2682 to score 3.0/5(+1-0=4). Wesley So started the 2nd half by drawing with GM Bruzon in R6 and GM Vallejo Pons in R7 to hang on to the lead. The turning point of the tournament was in R8 when Wesley So defeated GM Domínguez (CUB)2768, to boost his total to 5.5/8 points and widens his lead to a full point despite GM Bruzon (CUB)2682 the 2nd placer winning his R8 game versus Vallejo Pons, Francisco(ESP)2700 to score 4.5/8 points. In the penultimate round (R9), when all 3-games were drawn, Wesley So (draw with GM Ivanchuk) maintained his full point lead and virtually had clinched the title with 1-round to go. There were no surprises in the final round(R10), the three games again all ended in draws, so the Great Philippines Grandmaster Wesley So, just 20, won the 49th Capablanca Memorial International Chess Tournament, a history of sort being a first-timer against the 5-former Capablanca Memorial champions. So did a formidable performance in Havana. He annexed the title undefeated. 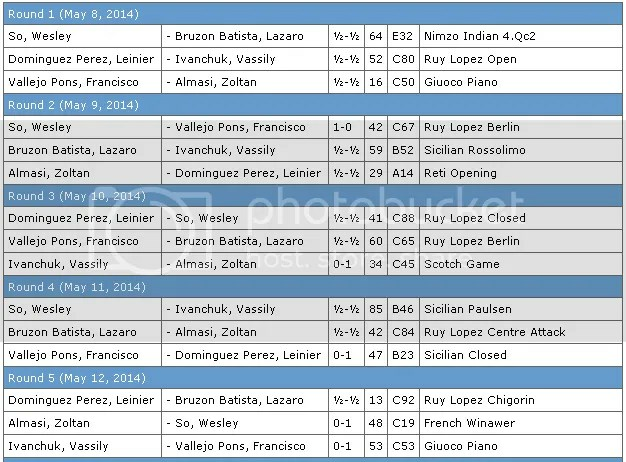 In his 10 games with 3Wins-NoLoss-7Draws (+3-0-7) record, he defeated Francisco Vallejo ( 2700) in R2, Zoltan Almasi (2693 ) in R5 and Leinier Dominguez (2768) in R8 and had drawn the other seven. So’s tournament performance rating(TPR) was 2829 and also had gained a +13.4 FIDE rating points. Live ratings of GM Wesley So (PHI)2731), Tournament Performance Rating (TPR) and his opponents in R1 to R10. 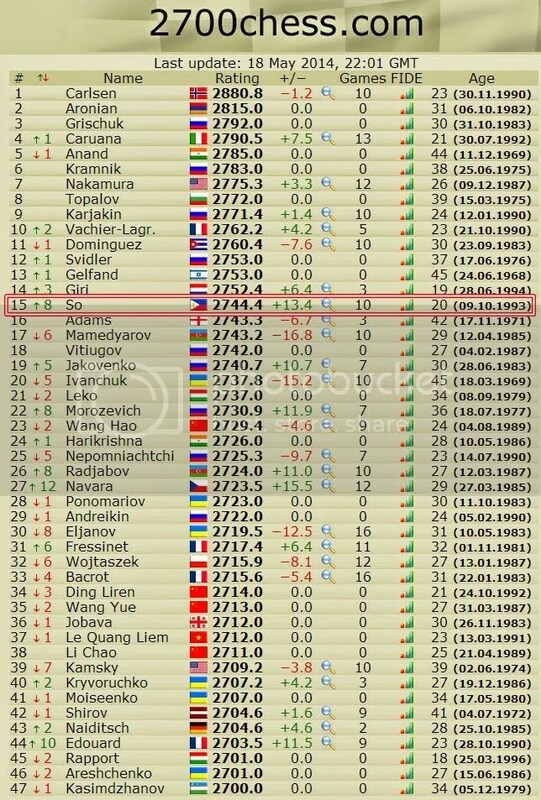 For the record Wesley So’s now do have a FIDE ‘Standard’ Live rating of 2744.4 that ranks #15 in the World’s live rating list as of 18 May 2014. This will be converted to 2744 come June 2014 FIDE rating publication. This 2744 rating will break his previous official peak rating of 2738 (February 2014). The 49th edition of the Capablanca Memorial International Tournament 2014 was held on 8th-18th May 2014 at the Habana Riviera Hotel in La Havana, Cuba. The event was organized by the Cuban Chess Federation and the Instituto Nacional de Deportes Educación Física y Recreación (INDER). Established since 1962 thru the initiative of Ernesto “Che” Guevara, the tournament was held annually in honor of the famous world figure and former Chess World Champion (1921-1927) Jose Raul Capablanca of Cuba. The Elite Group had six players, a Category 19 (with a rating average of 2721), and is a double round-robin tournament, composed of five(5) former Capablanca Memorial Champions and Wesley So a first timer in this prestigious tournament. The next Tournaments slated for GM Wesley So will be the Las Vegas International Chess Festival:on 12-15 June 2014 and the 9th Edmonton International Chess Festival in Edmonton, Canada on 20-29 June 2014. Some big names in the event include GMs Ivanchuk, Bruzon, Kovalyov & Krush. Wesley So next tournament is the National Open 2014, June 13-15, 2014, Las Vegas Nevada, a 6 round event with GM Kamsky on board. The followed by the 9th Edmonton International in Canada June 21-29, 2014, a 9 round event with Ivanchuk and Bruzon among others. I noticed the change in Wesley’s handling of time control after the Tata Steel Chess Tournament. In the recently concluded Capablanca Memorial, he was moving fast in the opening and early part of the middle game. With this adjustment, he was able to use his clock wisely and had ample time to spend in the crucial stages of the game. If I remember it right, it was Ms Susan who pointed to him his previous flaw in using the clock. Her advice was something to this effect, ” Do not to give your opponent too much respect.” As a result, Wesley never scrambled for time control in the recent tournament (the Capablanca Memorial) he participated in and in fact, won it. Congratulations, Wesley and Ms Susan.